If Your Jacksonville Gas Station Experiences A Water Damage Disaster, Call Our Technicians For Help! SERVPRO of Jacksonville South is prepared to answer emergency disaster cleanup calls 24 hours a day, 7 days a week. Working at a small gas station convenience store involves almost constant interfacing with people, and you may not always see who uses your facilities as you interact with customers at the register. At times, this can lead to a need for commercial water removal if, say, a customer clogs your toilet and covers your restroom's tile floor in water. If you need commercial water removal for your Jacksonville business facilities, the professionals at SERVPRO are ready to assist you. Our certified technicians have the tools and techniques to restore your commercial property's restroom for safe use safely. 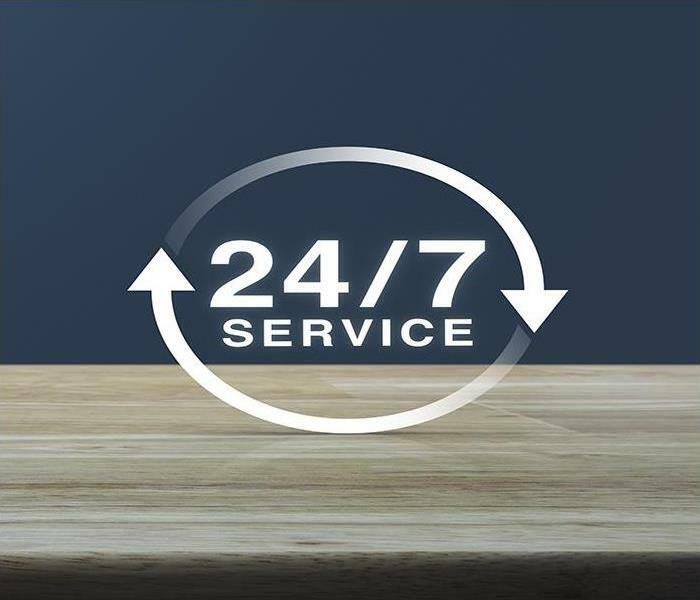 When you call one of our representatives, our team can come out to mitigate potential water damage within 24 hours. Water from clogged toilets must be treated with great care due to sanitary concerns from sewage exposure and is considered "black water" as a result. As our technicians arrive to restore your facilities, it is vital to extract contaminated water and spray surfaces with an EPA-registered disinfectant to kill bacteria. This process can be repeated numerous times in cases where potential sewage exposure is likely. Once thorough cleaning and water extraction has taken place, air movers and dehumidifiers are used to accelerate drying and prevent water damage to the subfloor. To effectively dry the tile and other nonporous surfaces in your commercial restroom, SERVPRO professionals can use a desiccant humidifier to eliminate moisture pulled up by air movers. These types of dehumidifiers work by allowing air to pass over desiccant materials like silica gel, and heat is applied to evaporate the collected water. While drying and dehumidifying, our technicians can use a variety of moisture measuring tools to ensure that your property has been thoroughly dried, including moisture meters, which can be set to evaluate a variety of surfaces, and thermo-hygrometers to get an accurate read of both temperature and relative humidity. SERVPRO of Jacksonville South is prepared to answer emergency disaster cleanup calls 24 hours a day, 7 days a week. If you need our services to mitigate damage to your commercial property, call us today at (904) 762-8066. Fire damage remediation in your home can encompass many things including debris removal. Contact SERVPRO for effective service. Restoring your Jacksonville property after a fire requires professional restoration technicians with extensive training in debris removal and cleanup. A failure to perform this step correctly could result in unnecessary damage or injury, not to mention a higher restoration and reconstruction cost. 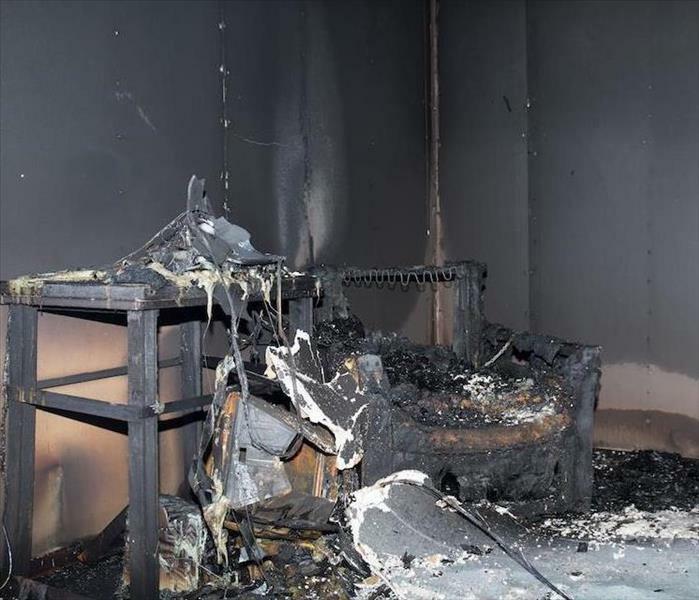 Addressing pressing concerns after a fire starts with a thorough examination and removal of the existing threats and overly damaged materials and contents. Our professionals can help with a fast response and expertise to perform this phase efficiently and thoroughly. Fire cleanup in your Jacksonville home happens in stages but begins with the inspection process. Our estimator and project manager can walk through your fire-damaged home with you to explain the work that needs to get done and to get feedback from you with how things should look when restored. This assessment is also critical for damage claim approval with your insurance provider. We work closely with area insurance companies to provide a fast and efficient claims process to ensure restoration work begins without delay. It is important to reach out to our SERVPRO professionals first, even before your insurance company, to get mitigation and clean up started in your home right away. Even though the fire has gotten extinguished, damage can still continually worsen from spreading soot and smoke residues, airborne contaminants, spreading odors and other threats. Our mitigation process not only seeks to address some of these concerns immediately but also allows our team to set up containment barriers to prevent these effects from spreading further through the property. With a licensed contracting firm among our SERVPRO team, we can offer controlled demolition and debris removal beginning with our initial visit. Once mitigation completes, these same experienced contractors can begin work right away on build back. Our comprehensive approach can save you time and money on getting your fire-damaged property restored entirely. Fires can greatly damage your home and require fast cleanup and debris removal to begin making it safer for restoration workers and others exposed to the compromised property. 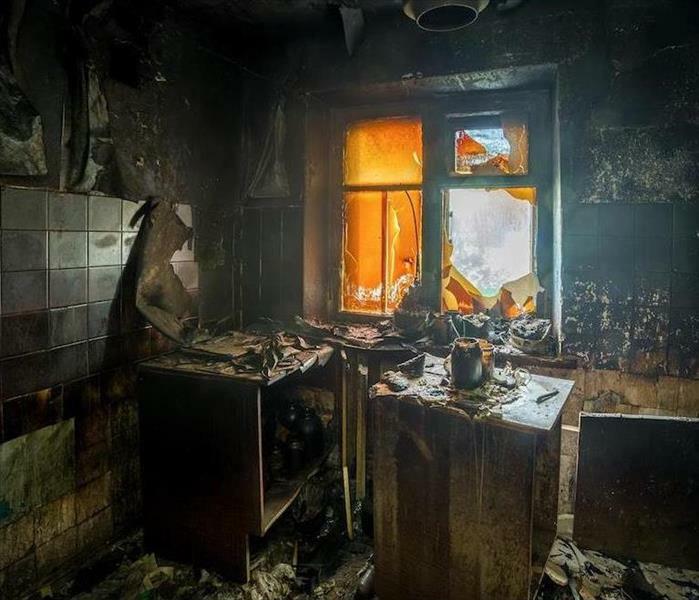 Our SERVPRO of Jacksonville South rapid response team can arrive quickly, 24/7, to make fire damages “Like it never even happened.” Give us a call at (904) 762-8066. Click here for more information about Jacksonville. We will help you prepare and plan for a flood. Call us anytime 24/7 for helpful tips and for flood restoration after the flood. We are here for you. 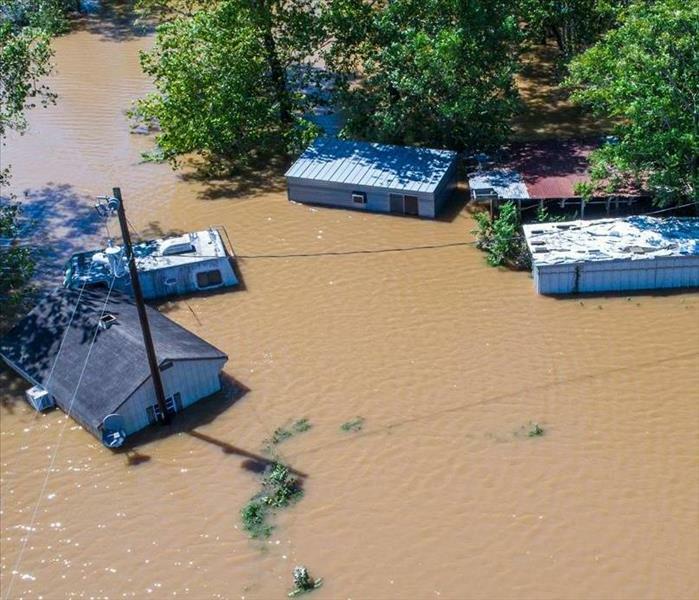 While flood damage in Jacksonville can be easy to deal with on your own, adding a family and household into the mix can significantly complicate matters. Protecting your home and belongings before a major storm or hurricane hits the area should factor into your thought processes as well. The further ahead of a storm you plan for disaster, the more likely you are to make it through without undue troubles. Flood damage in Jacksonville can pose a significant hazard to the health and safety of you and your family. Do your best to follow public service announcements about incoming storms and any evacuations that they may warrant, as these warnings are not made lightly and failing to follow them can lead to severe consequences. Additionally, you should have a waterproof container full of first aid supplies, flashlights, drinking water, and other survival essentials that you can access in times of need. Having a place to stay set up before disaster strikes can help you get to a safer position without confusion and time pressure. Relatives who live further inland or in elevated areas may be able to offer refuge. If this option is not available to you, please try to identify towns with hotels that fare better in most storms than your neighborhood. Whether you choose to ride out the storm at home or evacuate elsewhere please be aware of the dangers floodwaters pose both to individuals and vehicles. SERVPRO technicians have specialized protective gear before entering any flooded area. SERVPRO of Jacksonville South stays prepared before, during, and after every major storm to help out local homeowners with flood damage. Call us 24/7 at (904) 762-8066. "Looking for a vacation that’s equal parts fun and relaxing while also being one of the best value destinations in the world?" click here for more details. Water damage in your home can be dangerous. If your home has water damage, contact SERVPRO for remediation before the problem escalates. Baymeadows homes need to stay dry and free of intrusive water. Regardless of the source, water can create many hazards inside the house. Pests become attracted to homes with water damage and can include termites, birds, rodents, and harmful insects. When a Baymeadows home develops water damage in floors or ceilings, the safety of occupants can become an issue. Weakened areas in floors could let someone fall through while ceilings can collapse under their own weight. Even if it only involves someone's foot slipping through, an injury could easily happen. Plus, a hole in the floor requires immediate attention to prevent further accidents. SERVPRO technicians ensure that accidents do not happen by clearing the area of damaged materials and securely putting an adequately sized temporary floor in place. 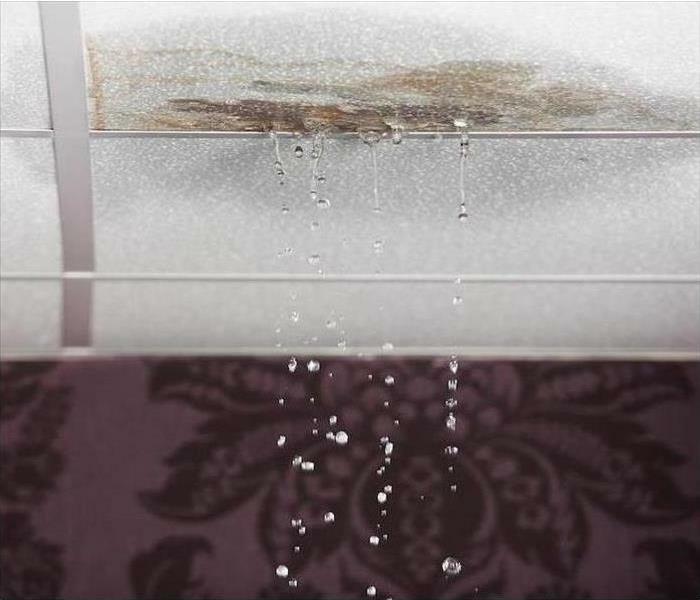 Because water damage affects the underlying areas of a floor, the damage can affect a more significant portion than what the homeowner might know about beforehand. We must remove the visible areas, as well, to reach the damaged area, requiring its replacement. When carpeting covers damaged floors, we do our best to save it, especially in large rooms. However, if the damage occurs in front of a sink or smaller area, it might prove worthwhile to use a more water-resistant covering in the future, to prevent future, additional water damage. Regardless of the damage's location inside a home, SERVPRO professionals always discuss the steps available in each unique situation. Although we want to leave your home “Like it never even happened.” we know that modifications can also benefit our customers tremendously. Please talk to us about any concerns you want us to discuss with you. We highly value your input into how we restore your home after water damage or any other disaster. We can more easily attain our goal, to make your home safe and secure for you and your family, when you partner with us. SERVPRO of Jacksonville South is always available to help area families keep their homes safe from water damage. For this and any other type of damage affecting your home, call us at (904) 762-8066, 24/7. We are always ready to assist you, no matter how extensively your home is affected. Part of commercial fire damage is water damage to important records. 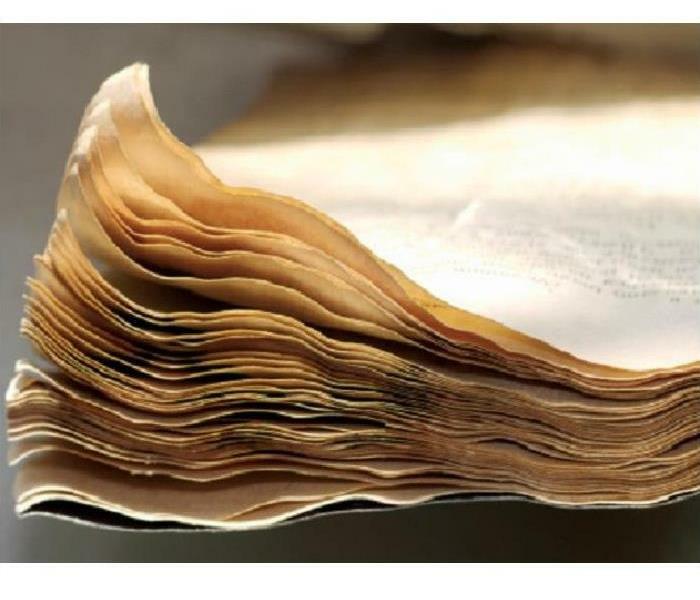 Call SERVPRO to help restore these damaged documents. Managing the aftermath of a fire incident in a commercial establishment such as a law firm can be difficult, especially if you do not take the right steps. Such incidents cause immediate and long-term implications, so it is vital for the response plan to address both. In many cases, it is the simpler aspects of the damage like remnants of moisture from firefighting efforts or residues in concealed areas, that cause long-term problems. The loss of crucial documents during incidents of commercial fire damage in Jacksonville is highly likely. Even if fire resistant cabinets or fire suppression systems protect the documents from burning, water used in firefighting efforts or during the cleanup and restoration that follows often causes damage. Our SERVPRO technicians take measures that help protect against losses during the restoration phase. We freeze any documents affected by water to prevent further deterioration. We also take proper inventory of all materials in the affected areas to ensure we return them to their original location after restoration. As a fire burns, it deposits different residues including soot on surfaces all over the property. Removing these residues is not easy, but it is necessary for functional and aesthetic purposes. Cleaning may be difficult because of the characteristics of the surface. For example, grouts on tiled surfaces tend to retain some residues complicating the process. Large offices also mean vast areas to clean. Our SERVPRO team relies on various advanced tools such as handheld motor scrubbers, steam vapor cleaners and multi-surface scrubbers to ease the process. Drying the moisture left from firefighting efforts and cleanup process helps prevent future problems such as bad odor and mold. Apart from drying the office thoroughly, it is necessary to finish the drying process fast. Otherwise, problems like microbial growth can overtake the process. Our SERVPRO technicians use advanced equipment such as trailered-in desiccant dehumidifiers connected to a series of ducts to dry affected areas faster. Working with experienced restoration companies helps to restore normalcy faster after fire incidents. SERVPRO of Jacksonville South to help you any time you face problems. You can reach us at (904) 762-8066. We're Faster To Any Size Disaster. Read more about Jacksonville here. You can manage flood situations better with help from SERVPRO of Jacksonville South. Your house can flood within minutes whether from rising groundwater, leaking roof or other sources. However, the repairs and cleanup necessary to restore the property to its preloss state can take many days or weeks. The burden is higher if the affected San Marco homeowners choose to handle the restoration on their own, or hire restorers with limited resources. Our services are IICRC certified which means we have enough resources to help lift most of the burden off your shoulders. Usually, an incident of flood damage in San Marco leaves many areas around the home in need of attention. For example, there is a need to remove standing water or move items. There is also a need to fix any parts of the structure affected by the water and cleanup of any soils left in the wake of the flooding. Since our SERVPRO technicians work as a team, it is possible to address different issues at once. Teamwork not only reassures the homeowner but, also helps save more items. Most of the work involved in the restoration is tedious and repetitive. For example, scooping off the standing water with buckets or scrubbing off soils from surfaces with brushes is backbreaking work, which also lengthens the restoration process. Our SERVPRO technicians use advanced equipment that lightens the load and quickens the turnaround time. For example, using truck-mounted water extractors, we can remove up to 36000 gallons of water per day. We also use submersible pumps, which are more efficient for water deeper than two inches. Floodwaters contaminate porous materials in the house deeply necessitating removal. Commonly affected materials include carpets, drywall, and insulation among others. Removing and replacing these materials is a complicated and tiring process. Our SERVPRO technicians rely on a plethora of tools including pry bars, rubber hammers, and molding lifters among others that help ease the process and reduce chances of damaging other sections of the property. You can manage flood situations better with help from SERVPRO of Jacksonville South. Call us at (904) 762-8066 any time. We’re Faster to Any Size Disaster. Click here for more about San Marco. Our technicians have access to advanced equipment that can help rid your home of odor after a fire. Call team SERVPRO for effective results. Recovering from a fire disaster is a many-phase process in Jacksonville. Our highly-qualified fire mitigation team takes the process step by step, ensuring we miss nothing in our quest to make your fire crisis “Like it never even happened.” From water and chemical removal because of firefighting efforts to customized residue cleaning and charring restoration, we handle all necessary tasks safely and professionally. Lingering smoke smells make fire odor removal a must in your Jacksonville home. No matter how untouched your dwelling looks after our team finishes surface cleaning and damage restoration, the unmistakable odor of the combusted building materials and contents brings back unpleasant and perhaps terrifying memories. SERVPRO fire remediation crew members approach odor removal systematically, following protocols learned during Institute of Inspection, Cleaning, and Restoration Certification (IICRC) training. We start by removing the burned materials, including scraping down charred structural materials to undamaged layers. A thorough cleaning removes many of the odor-bearing residues. If a smell continues to emanate from a cleaned surface, we might consider sealing with appropriate professional products. HVAC systems can spread and retain odor-bearing particles. If vents are open during the fire or fire residue cleaning efforts, the odors drift far from the fire site. At a minimum, filters need changing, and the system needs to be turned off for evaluation. SERVPRO experts inspect the ductwork to see if cleaning or sealing is indicated and make arrangements to complete that service. Airborne soot particles and those that settle on surfaces and furnishings are tiny yet pack a pungency that must be addressed. SERVPRO crews prefer to use techniques and equipment that eliminate the odors rather than covering them with distracting perfumes. Thermal foggers recreate the conditions of the fire to disperse heated chemicals that attach to the granular bits and neutralize the smell. We also use hydroxyl generators or ozone machines as another way to attack the odor problem at a molecular level. Enzymatic products can help with organic soiling and smells. Rely on the team at SERVPRO of Jacksonville South to eliminate the smoky odors that might otherwise remain in your home even after fire remediation. Call us at (904) 762-8066 to get the process of odor abatement rolling. Whether an item can be restored or needs replacing is a decision that can save you money in the long run. Contact our certified technicians. 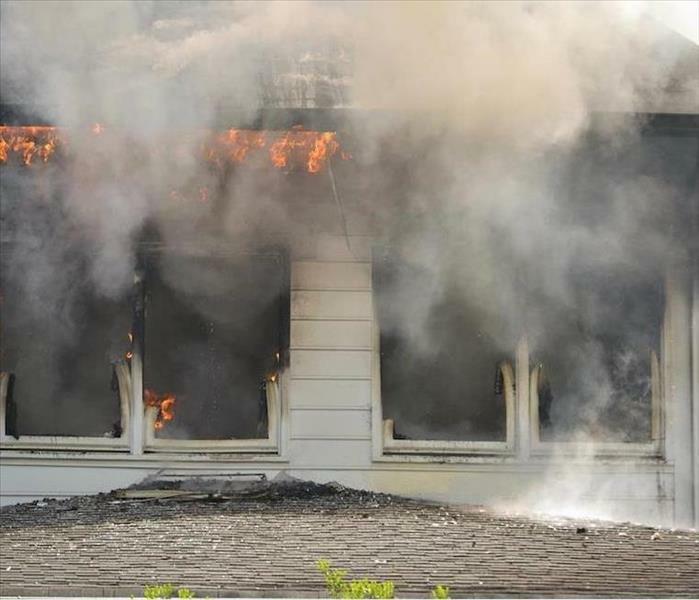 If a fire ever starts on your property in Town Center, there are three main methods professional restoration companies such as SERVPRO use to remediate issues caused by the blaze. The most expensive option is replacing items, and it only gets implemented if the fire damage has burnt objects so severely that they cannot be refinished or cleaned. In some cases, the charred materials exist only on the surface and refinishing the substances can bring them back to their preloss state. In more minor situations, objects inside your home can be restored using various cleaning procedures. Before we begin any fire damage mitigation work, we comprise a list of the objects in your home and outline whether the item needs to be replaced or if it can get refinished or cleaned. When figuring out whether or not an item is cleanable, our SERVPRO technicians test-clean the surfaces and see which chemicals work best. When remediating fire damage in Town Center, our team can use several different methods to clean soots and soils from the various surfaces inside your building. When a fire burns it uses a variety of fuels, therefore the soot residues that remain have different chemical compositions. Every different type of soot or soil adheres differently to the various surfaces inside your home. When cleaning your contents, we utilize several different methods to return them to their preloss condition. In some scenarios, our SERVPRO technicians can use wet cleaning methods. During wet cleaning, we apply alkaline based detergents on a rag and then rinse them off with clean water, and then dry them with a towel. For hard surface contents, we spray the detergent onto them and then wipe off the chemicals. For easily ruined surfaces, we often use foam cleaning because it does not damage fragile surfaces. For more severe situations we can utilize abrasive cleaning methods that get applied with steel wool or other scrub pad. For some items, immersion cleaning proves to be the best. During this method, we drop your contents into detergents and then rinse them off. If you ever need help restoring your possessions after a fire, call SERVPRO of Jacksonville South at (904) 762-8066 24/7. Click here for more information about Town Center. 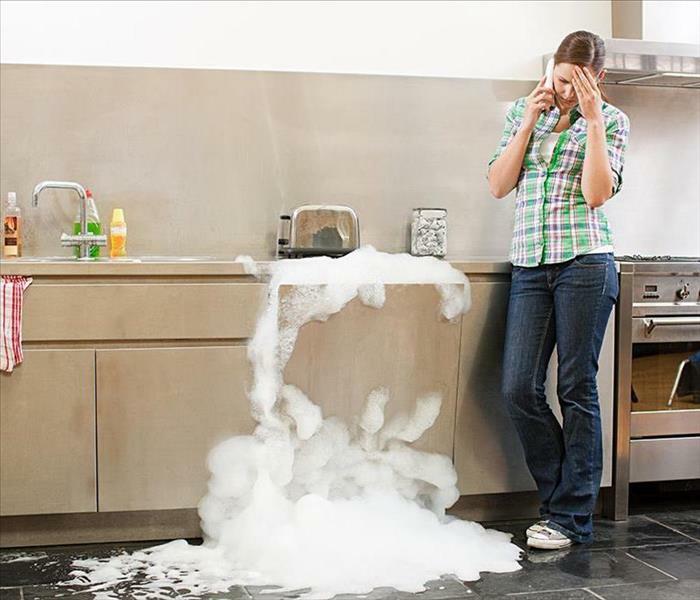 Our technicians are trained to cleanup any water spills, no matter how big or small the mess might be. Severe water spills happen mostly when a home is unattended creating the opportunity for maximum damage. Apart from no one being around to turn off the mains, the water that spills also gets the chance to migrate unabated. Depending on the time taken before clean up to start, many other problems like microbial growth, bad odor, and loss of structural integrity might develop complicating the restoration process. We offer professional restoration services to help Jacksonville homeowners deal with the damages suffered. The volume of water spilled is the central aspect that influences the process of water cleanup in Jacksonville. When much water is involved, it is likely to spread to many parts of the house increasing the burden of cleanup. Our SERVPRO technicians work as a team, therefore, providing extra pairs of hands to tackle the cleanup. We also have different sophisticated tools like truck mounted water extract and dry-wet vacs, which quicken the water removal process. Water can lead to different types of soiling. The most common is staining which happens when dyes in fabrics or furniture items run spreading to other contents. Sometimes the spill can originate from a broken appliance such as a dishwasher or washing machine, which leads to the spread of detergents, food remains and other wastes from the appliance. Water also spreads debris such as pet waste or dust already present in the affected areas. The level of soiling can prolong the cleanup process, especially if done by hand. Our SERVPRO technicians use different approaches to deal with soils including the use of power washers. We also remove stains from carpets or fabrics before drying them to prevent settling. Drying a property after water loss is crucial because it eliminates problems like bad odor and microbial growth. The level of water migration determines how long it takes to dry the home. For example, if water only affects a carpet but not the underlying floorboards, drying is faster. Our SERVPRO technicians use different moisture detection tools including moisture meters, thermal cameras and moisture sensors to gauge the level of migration. We then choose the right drying equipment including air movers, dehumidifiers or injectidry systems for moisture removal from concealed spaces. In case of a water spill, call SERVPRO of Jacksonville South. 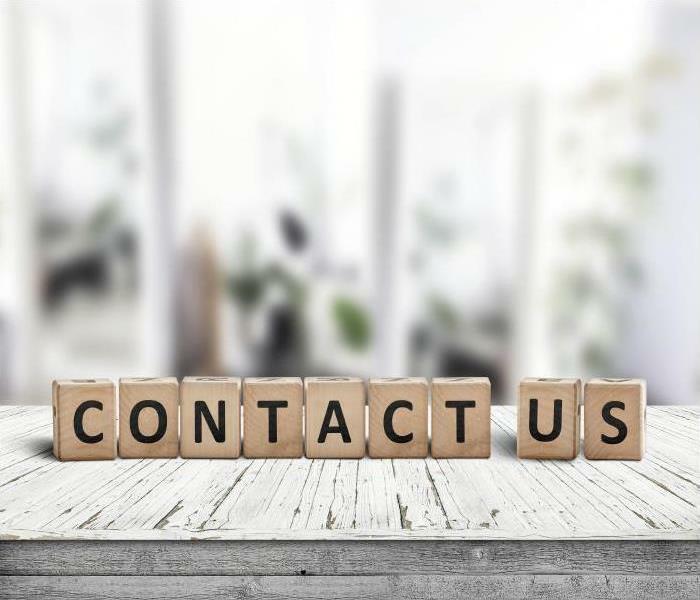 You can reach us at (904) 762-8066 any time. For more on Jacksonville, click here. 4/16/2019 - If Your Jacksonville Gas Station Experiences A Water Damage Disaster, Call Our Technicians For Help! 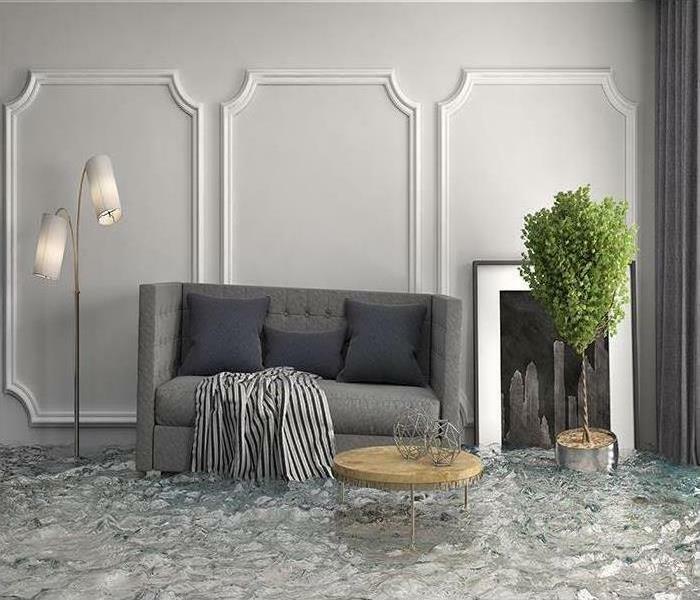 4/9/2019 - After A Flood Causes Damage To Your Jacksonville Home, Call Our Experts Immediately!